While wandering the grocery isles I found some marrow bones. Now the kid in me cringes at all things “weird”. Eating bones and organ meat is “weird” to me. I want to be more open to this but I end up thinking way too much about it and then can’t eat it. This was how I used to be about meat on the bone. Couldn’t/wouldn’t eat it. Now I think bone in meat is much tastier and makes a great stock homemade stock. I’ve never tried to make a beef stock before from marrow bones. But with the big push I’ve been seeing on paleo sites to eat nose to tail, I figured I’d give it a go. 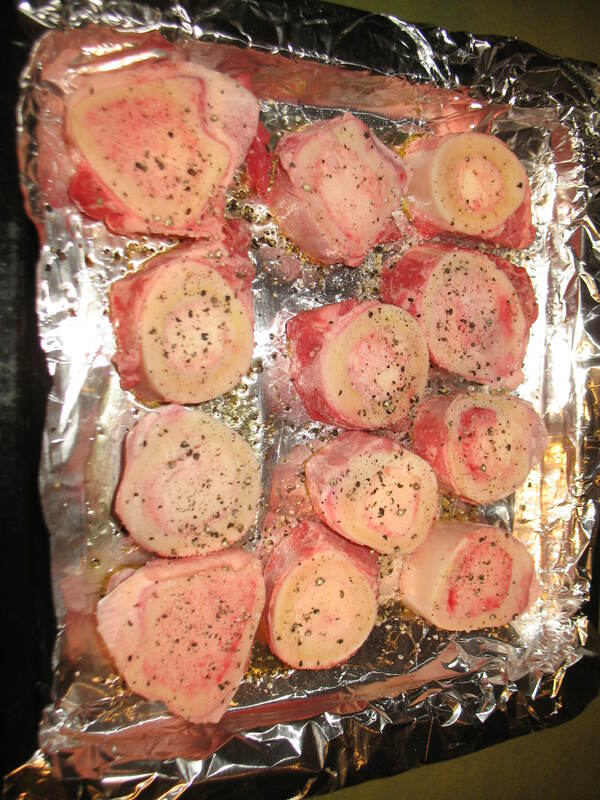 Besides, marrow bones didn’t look all that different than any other bone I’ve eaten off of. First thing everyone who tries this recipe needs to know it that there is a definite smell to the bones while roasting and simmering. It’s very beefy. Yes, I described a beef product as beefy. The smell is very strong and I almost just gave it all to the dogs because I thought the bones had gone bad. The smell is apparently normal. I found out after a bit of perusing the web. It will lessen over the next two days. Yes, two. 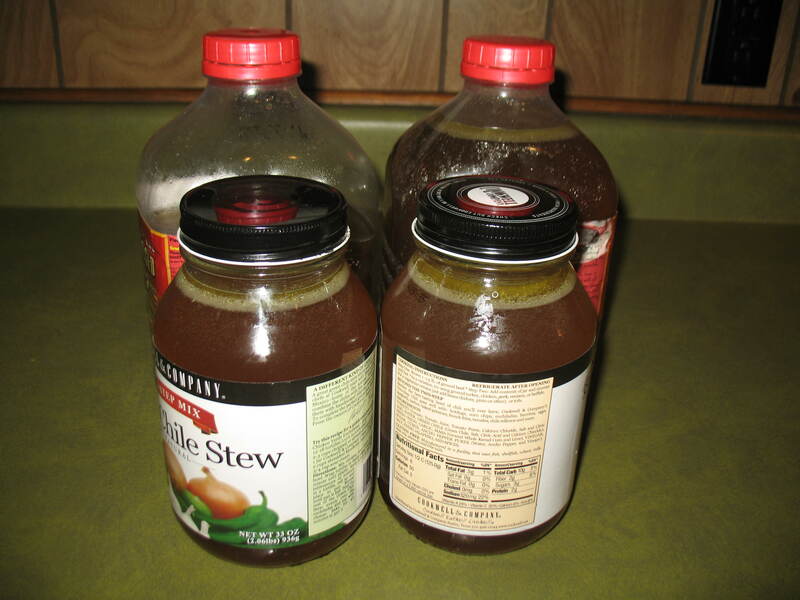 This stock made almost 2 gallons and I will be using it this weekend for some French onion soup. But for now here is the how to. Roast bones with a little salt and pepper for an hour at 400. 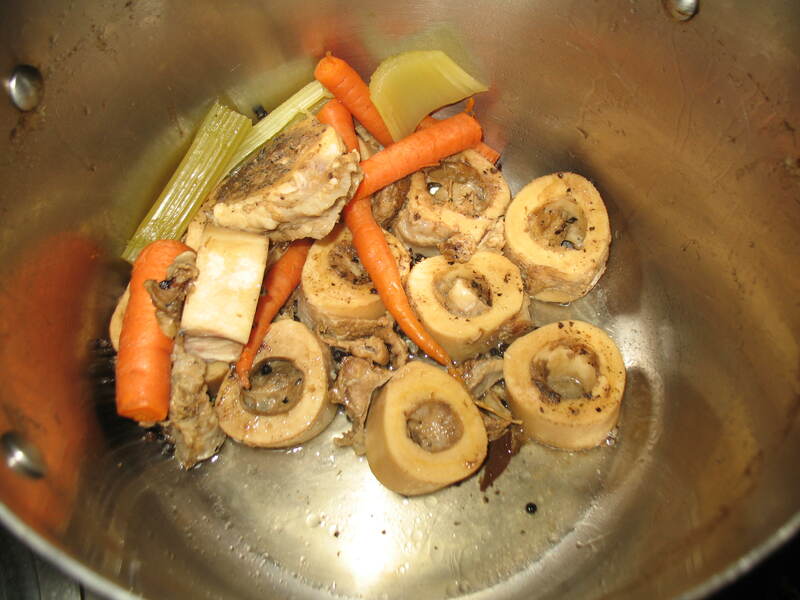 Place bones in a large stock pot and fill with water. Add about 2-3 tbsp of black pepper corns, and 3 bay leaves. Simmer on low for a day. 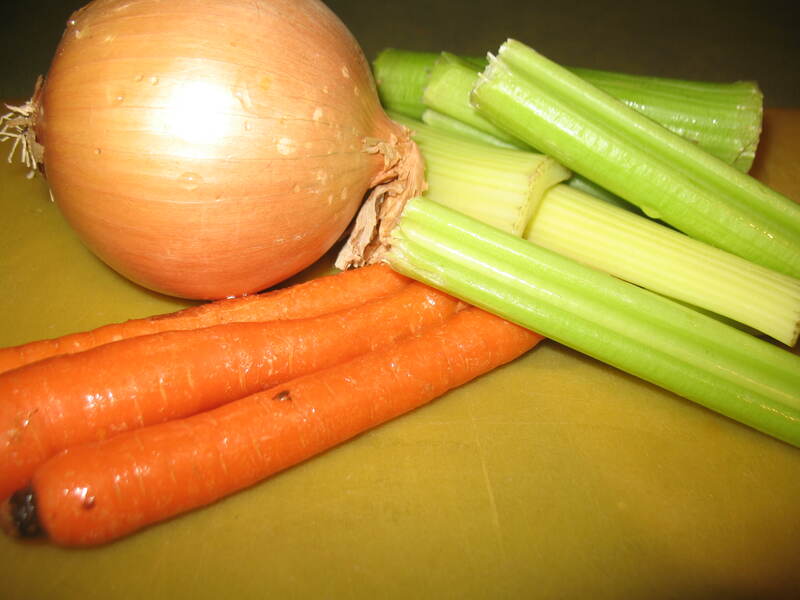 Remove the bay leaves and add celery, carrots, and an onion. No need to chop the celery and carrots but you’ll want to slice the onion in half. Simmer for another day. After two days of cooking, remove from the heat. Strain the solids out. Pour into containers. Some people remove the fat others don’t. I’m a leave the fat in sort of girl. 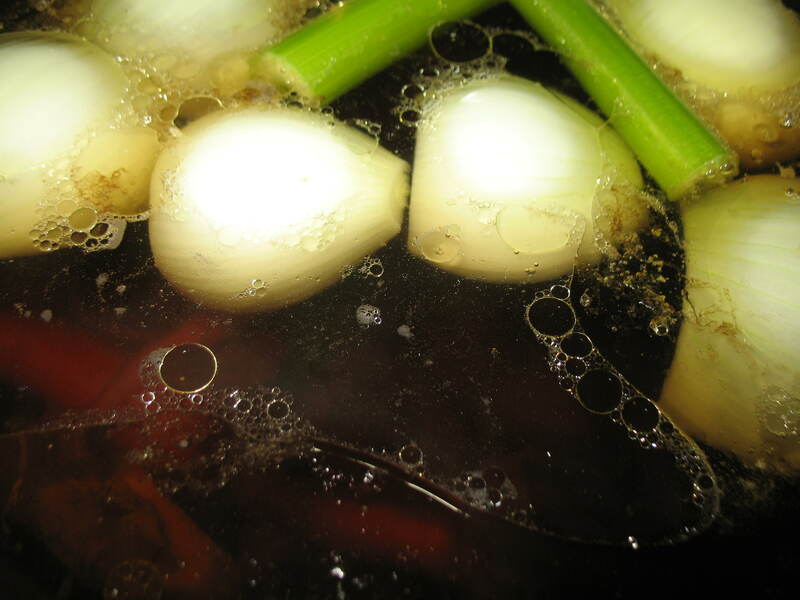 The stock is a rich dark color, it smells beefy and the vegetables made a great addition. I’ll let you know how it works as a soup this weekend. This entry was posted on Thursday, January 26th, 2012 at 12:28 am	and posted in Beef, how to. You can follow any responses to this entry through the RSS 2.0 feed. My fingers are crossed. It looks like very good broth so I’m excited. 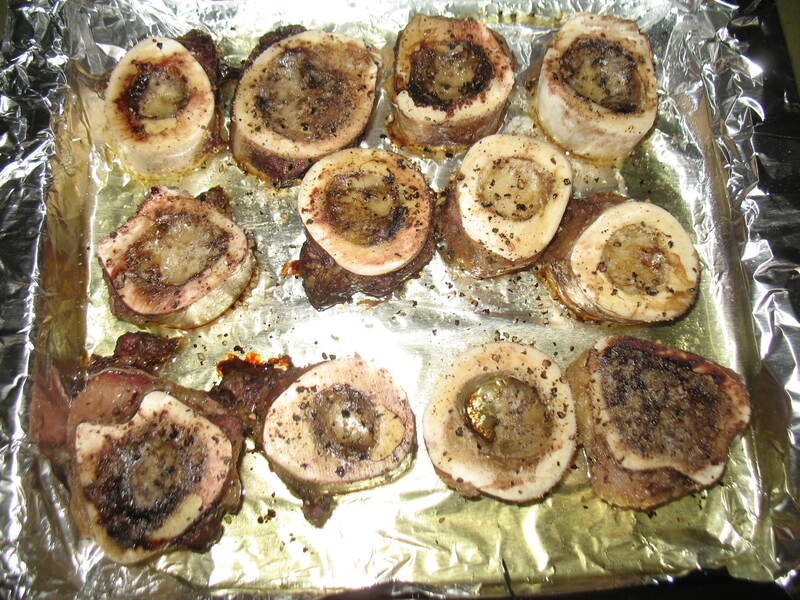 Mmm…I’ve been thinking about making marrow stock the next time I see bones in the grocery store. When you say that you cook it for 2 days – do you mean 24 hours x2? or do you just cook it during the day and turn the stove off at night? I leave it on the stove and cooking for two days. Sunday afternoon I put it on and Tuesday morning I took it off. It was shy of two full days but I work during the week and that morning was the best time for me.